Aboard your luxurious private train, you can expect well-appointed en-suite cabins, fine dining and elegant surroundings - no matter where you choose to explore. Arrive at Moscow airport, where you are met and transferred to the luxurious five-star Marriott Royal Aurora hotel (or similar) located in the heart of this vibrant city for a one-night stay. Morning city tour of Moscow principally takes us to Red Square, an iconic symbol of Russia’s former military and political might. Here we see an eclectic mix of fascinating architecture, such as the ornate St Basil’s Cathedral with its magnificent onion-domes, the grandeur of the Kremlin and the sombre and evocative site of Lenin’s tomb. With our multitude of included day trips you may instead wish to visit, for example, the Tretyakov Gallery or travel outside Moscow to the ancient town of Sergiev Posad, home to one of the most beautiful monasteries in Russia and the Spiritual centre of the Russian Orthodox Church. We arrive at the picturesque and historic city of Kazan by mid-morning. Situated on the River Volga, Kazan is the capital of Tatarstan. Here we have the opportunity to see for ourselves its rich tapestry of history and culture. One of the highlights of the city tour is our exploration of the Kremlin Fortress, a UNESCO World Heritage Site. We cross the Europe-Asia divide before arriving in the historic city of Yekaterinburg. Founded in 1723 by Peter the Great, the third largest Russian city is also the capital of the Urals. A day to unwind and reflect on the many sights and sounds we have experienced on our journey so far. 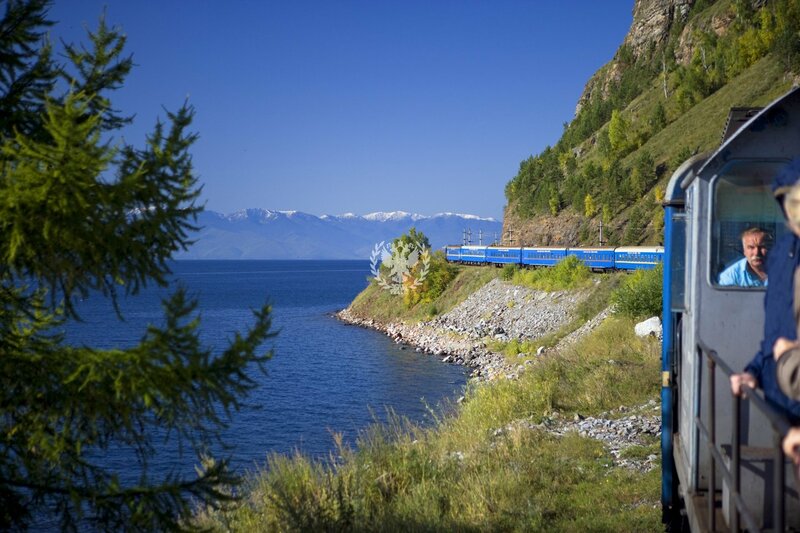 Few natural sights can surpass the beauty and grandeur of Lake Baikal and is a major highlight on our Trans-Siberian journey. For five hours we wind our way through tunnels along cliff hugging tracks above the lake with a vista of snow capped peaks along the far shore forming a picture-perfect backdrop. Lake Baikal is the deepest lake in the world and holds 20% of the world’s freshwater. Also known as the ‘Pearl of Siberia’ it is home to a unique breed of freshwater seal and over fifty species of fish including omul which we will be serving in the dining car for some of our meals. Weather permitting, we stop in an extremely picturesque location by the lake for photographic opportunities and for the brave hearted, there is even time for a refreshing swim in the crystal clear waters. The full train comprises of twelve fully en-suite Silver and Gold Class sleeping cars which feature state of the art amenities. Gold Class Cabins are 77 sq ft (7 square metres). The Cabins are well-proportioned and have everything from power showers and underfloor heating to a DVD/CD player, LCD screen and individual air-conditioning. Silver Class cabins are more compact at 60 sq ft (5.5 square metres) but have similar facilities. A particular delight of the Golden Eagle is one of beautifully appointed Restaurant Cars, the venue for our chefs to serve carefully-prepared meals using wherever possible only local ingredients. Whether it be the world-renowned ‘Borscht’ or Omul, a fish unique to Lake Baikal, you will be offered a culinary experience representing the very essence of Russia. The meals are complemented by wines from around the world, as well as – naturally – vodka. The social heart of our train is the the Bar Lounge Car, a great place to relax and settle into the unhurried pace of life on board. Unwind in comfortable surroundings and watch the world go by as you get to know your fellow passengers. Enjoy the sounds of the pianist playing in the evenings. The bar stays open until the last person leaves.